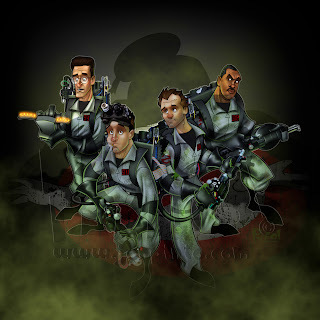 I love Ghostbusters. Really, who doesn't? If you are my age you not only have such fond memories of the movie and still quote lines from it, but you also are flat out shocked at how old these guys are now! And then I remember how old I am. What a downer! I have been toying with this drawing for some time and finally got down to it in earnest. I then took breaks to do the Nelson posting and the Inspector Gadget drawing. I am SO easily distracted! What was I talking about?? Oh right, the Ghostbusters!! Just for some added fun (I hope), I also screen grabbed images and made a seperate file to "animate" the progress. I don't have a program that actually records me working so I simply used the animation tool right within Photoshop. Was fun but I kept stopping the actual picture to update the film! Turned out kinda cool tho. I hope it posts okay here.